Fig. 1: Example of how the pure parallel program works. 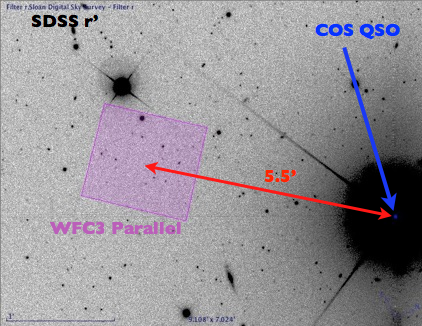 While a nearby quasar is observed by COS, the WFC3 is turned on to collect data on a nearby, random parallel field. Fig. 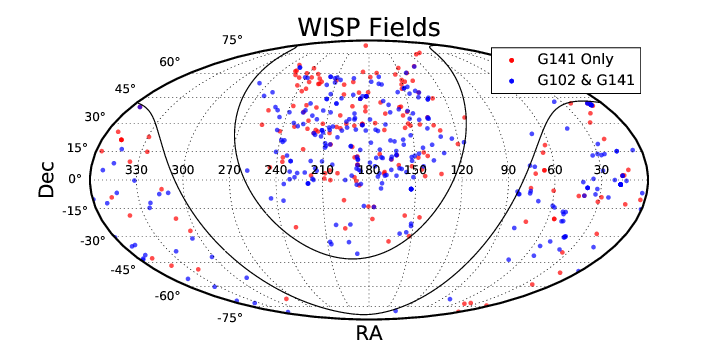 2: Locations of the WISP parallel fields. There are a total of 483 fields within the program up to Cycle 23. A total of 392 fields are included in this release. WISP is a large HST "pure-parallel" program using the WFC3 G102 and G141 grisms to obtain images, spectra, and catalogs of star forming galaxies between redshifts 0.5 to 2.5. The primary science goals are to measure the star formation history over the last ~10 billion years, probe galaxy clustering on Mpc scales at redshifts 1 < z < 2, constrain the evolution of dust extinction and metallicity as functions of mass and luminosity, and to conduct a serendeipitous search for highly luminous Lyman alpha emitters beyond redshifts z > 6. Fig. 1 demonstrates how WISP observations are taken in parallel while COS is being used by another program. Fig. 2 shows the locations of the WISP fields. Each galaxy+instrument is organized into a subdirectory structure, based on the version of the data release, and the Parallel Field ("par") number. _spectra-header.txt This text file contains header information for each extracted spectrum, such as the central coordinates for the first exposure, the filters used, and exposure times. It also includes descriptions of what each column represents within the "_spec1d.dat" files. The same header applies for each extracted spectrum in the folder. _spec1d.dat These text tables contain the wavelengths, fluxes, flux errors, flux contaminations, and flux source flag for each target. The "zeroth" column (last column in the file) is a flag that can be one of three integers: 0=no contamination, 1=contamination from the zeroth order, and 2=edge truncation. The source ID is included in the filename, e.g., "hlsp_wisp_hst_wfc3_par1-0025a_g102-g141_v5.0_spec1d.dat" is the spectrum for source #25 in parallel field #1. _stamp2d.fits These FITS images contain the distortion-corrected 2D aXe-drizzled spectra cutout stamps for each target's first order beam. The source ID and grism information are included in the filenames, e.g., "hlsp_wisp_hst_wfc3_par11-00001a_g102_v6.2_stamp2d" is the 2D stamp spectrum for source #1 in parallel field #11 in the G102 grism. _catalog-header.txt = This text file contains header information for the first exposure taken in the direct imager sequence of observations. Information includes the central coordinates and date/time of the (first) observation. _cat.txt = Source catalog for the given filter, derived from the direct images using SExtractor. Source IDs between 1000 and 2000 are sources detected only in the bluer filter, while sources with IDs greater than 2000 are detected only in the redder filter. _drz.fits = Drizzled science image for the given filter. The one's that being with "f" (e.g., "f110w", "f140w") are from the imager, the "g101" and "g141" are the 2D spectral images from the grism. Some have different resolutions available, the resolution is included as part of the field name, e.g., "par1-80mas". Each field has an entry in the table below. You can browse the entire directory contents using the "browse" link inside the "Field" column. Hover over any of the "IMG" links to see a preview image (both for the direct images and the grism images). Most of these are the 80-mas versions, but if one doesn't exist then the 40-mas resolution is used. Click on the "IMG" links to download the FITS file (reminder, this is only the 80-mas or 40-mas resolution version, if you want others, click the "Browse" link). Click on the "CAT" links to download the catalog FITS file for that filter/grism. You can also download a tarball of all the extracted spectra for the field using the links in the last column. Note: The table is sortable after the rows' background colors become alternately colored white and blue. This takes a while for most browsers. All other functionality, such as the links in the table, is ready immediately.